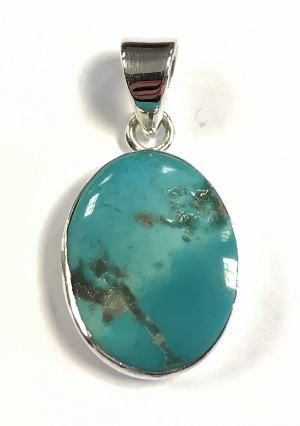 A charismatic pendant with Turquoise from the Sleeping Beauty Mine in Arizona. Turquoise occurs by the action of water on copper and aluminium, forming tiny crystals in large chunks. It has been valued throughout time as a protective stone by cultures the world over. Key Healing Properties: Turquoise is a strong activator of the throat chakra, assisting personal expression. The lesson of Turquoise is to rise to the challenge of when it is your time to speak out, arbitrate or take the lead in bringing a matter to fruition.